November is filled with DANCE and we wanted to share all the upcoming events that you and the dance lovers in your life won’t want to miss. 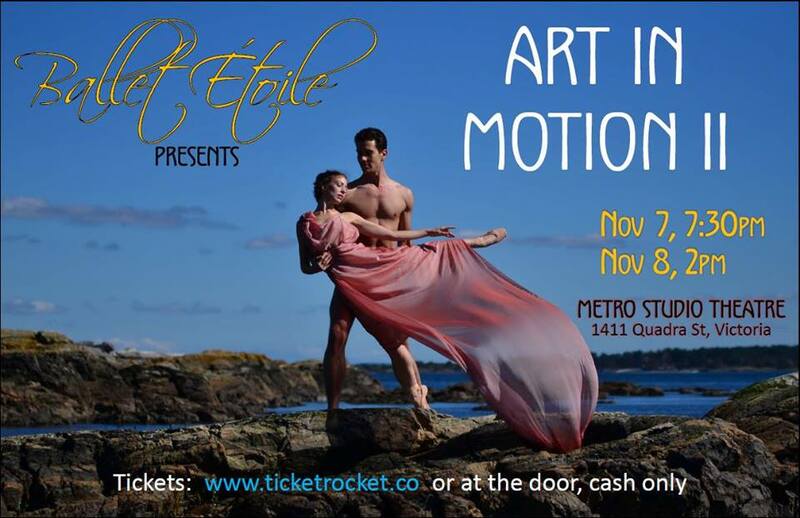 Love the concept and I always enjoy Ballet Étoile’s movement and performances around Victoria. This is the best way to start off Dance November. Description: A collection of new, original dances brings to life some of history’s most celebrated artworks. Famous paintings and sculptures by Leonardo Da Vinci, Michelangelo, Johannes Vermeer, Gustav Klimt, Mark Rothko, Jackson Pollock and more are reinterpreted and reborn through evocative and innovative choreography. I go over to Vancouver whenever I can to attend workshops and see Ballet BC perform so I am over the moon that they are once again part of the Dance Victoria 2015/2016 season. You can say you were there first at Convergence’s premier performance. Artistic Director of Convergence and owner of Westcoast Academy of Performing Arts, Dana Fry, brings together the Victoria dance community to explore the talent on the island. Broken Rhythms (my Rhythmical Contemporary Company) has been invited to perform at this event and will be showing two new works. Description: Convergence Contemporary Ballet Company’s show marks the emergence of a new voice for contemporary ballet in Victoria. They are performing three new works: Andante, Shift and For Now I Am Winter. Broken Rhythms is also premiering two new works, 1518 that took place that year in Strasbourg, and Grey Matter, a truly unique work encapsulating the rhythmical contemporary style Broken Rhythms is recognized for. Looking for something a little different? Harem, hosted by Sacred Centre Dance, will perform their unique contemporary fusion belly dancing at McPherson. I have seen them dance at different venues and events around Victoria and am excited to see them again. Description: In his sixth production, artistic director Nath Keo choreographs in Turkish, Egyptian, fusion and contemporary belly dance styles in homage to the harems of the Ottoman Empire and their history of cultural fusion. This heady blend of popular and eclectic world beat music, Keo’s signature style and loads of sass from the Sacred Centre dancers will change your notion of what it means to be in a harem. *This post was written by artistic director of Broken Rhythms Dyana Sonik-Henderson to share dance shows happening in November. Please let me know if any Dance performances were missed and follow Broken Rhythms Victoria on facebook for more posts about dance events in Victoria.